I’ve always held a certain affinity for the El Camino. It makes no apologies for what it is; niether car nor truck nor particularly attractive. But it lasted a long time and plenty of people purchased one. 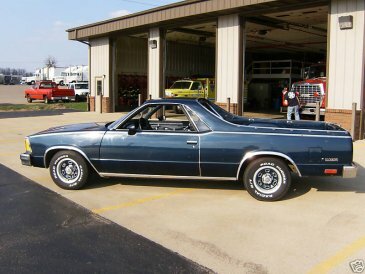 With the body of a truck but the handling of a car (sorta) many unfair stigmas came to be attached with the El Camino. But just like the original El Camino did back in its heyday, Tom Leitschuh’s El Camino is breaking conventions by going 100% electric. Say what? An electric El Camino? It seems almost too outlandish to believe, but its true. Tom removed the engine, gas tank, radiator, and other unessceary elements, but held on to the Chevy 3-speed manual transmission. 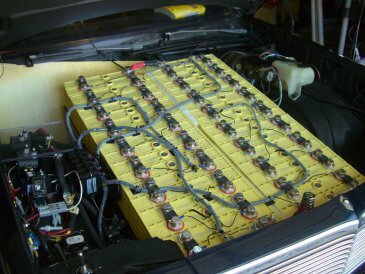 This lessened the weight of the 1981 El Camino, allowing him to drop in 46 lithium-ferrite batteries. These batteries are good in 0 degree weather, something a lot of hybrids have a problem with. That is a good thing too, because Tom lives in Wisconsin, and the cheese state can get mighty cold. But that is over 900 pounds of battery weight, a common problem with electric conversions. The batteries are spread out evenly between the engine bay and over the rear axle though, somewhat off-setting the precarious imbalance. Ground clearance may be an issue if he ever decides to laden the El Camino down with say, a dead cow (Top Gear reference). The El Camino can supposedly get 200 miles on a single charge if carefully driven, but averages about half that. I can’t find anything on how fast this car will go, how much horsepower it has (probably not enough) or how long it takes to charge. But Tom has his own solar and wind farm, so he doesn’t pay a penny for energy. Whats more, the entire conversion, including El Camino purchase, cost only $30,000. In the grand scheme of things, that is a pretty good price (though several companies donated time and parts to the project). I wholly encourage the use of any old muscle cars for alternative energy conversion projects. Tom’s next project? A clean Corvette. In my opinion, that is awesome, but ONLY if it can go at least as fast as its gas-powered cousins. If he chooses something from the late 70’s/early 80’s, that shouldn’t be a problem. But a slow Corvette is heresy, no matter what.